Amid high levels of violence, social turmoil, and failures in governance, there is a deep hunger for justice among people and nations worldwide. Can our societies overcome such tragedies and get back on track? Are political justice and human flourishing possible? 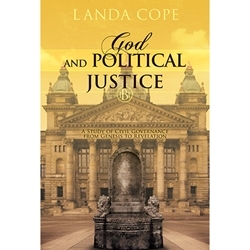 In this much-anticipated volume in the Biblical Template series, Landa Cope shows that the answer is yes-and it will require hard work and an unwavering commitment to God's revealed principles. "This book," she writes, "is the best insight I have to offer after twenty years of study of the subject [of political justice] in Scripture. . . . It is an attempt to let God speak for himself again from his source material, believing only a consistent and faithful return to his Word and the help of his Spirit will show any generation the way forward." "What does the biblical history in the Old Testament say about governments and societies of the twenty-first century? Everything! If you care about making a difference in the society in which you live, I implore you-learn the lessons God has for us as they are unpacked in God and Political Justice." "If the Bible is the blueprint for God's design for justice on earth, then God and Political Justice is the manual on how to unpack it. The entire weave of God's justice plan is explained with such thorough and painstaking detail, from Genesis right up to Revelation. After reading this book, we have no excuse to claim that we don't understand God's views on this topic." "In her latest book, the panoramas [Landa Cope] creates with words will sweep you into the alternative universe-the world of reality, not illusion, where God dwells and interacts in space and time with humankind. Read this book and stand ready to join the Wilberforce generation, a modern-day generation of Christians committed to creating godly culture and building nations for the glory of God."